Description of "Witness to a Wandering Mind"
The story of a sleepy village, set in the backdrop of early 20th century undivided Punjab, takes the reader through the twists and turns of the author's life. It graphically describes the events where fears and falsity land various characters in unsavoury situations and how they bear the fruits of their karma. There is Parmanand, who left the sanctuary of a safe but vacuous existence, in search of a better but unfathomed life to turn into a neurotic teacher. There is Indro, who had to carry the cross of a tedious life to lose vitality in a wasting physiology. It is an account of Devki, who became the mother of sons older than herself and also suffered early widowhood. There is a near death experience of a sensitive child and also of certain death of a new born, one brought about by complex circumstances. There is turmoil and trauma on the eve of Independence. There is Congress, there is Muslim League and there is RSS. There is a painful incidence of personal incarcination engendered by misconceived sense of sacrifice. With an uncanny eye for detail, the author delineates various lives to analyse if the Law of Karma is, indeed, rooted in actions sown as seeds to bring forth fruits, now or hereafter. Without getting involved with the playfulness of his wandering mind, he endeavours to study if there is some order underneath a seeming chaotic existence. In the process, he looks at the real, imperfect, flawed, quirky, weird, beautiful and magical side of the dramatis personae to take the first steps towards Self realization. TRILOKNATH, born 1933, has been witness to an eventful era and has undergone a stressful existence. He has seen rural life from close quarters and has chronicled the present work as a means of self expression. 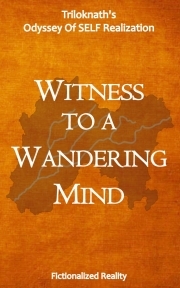 Reviews of "Witness to a Wandering Mind"
Life like description of places, people and situations. Nostalgic memories of pre-partition Punjab. Fascinating historical events. Engrossing and truthful expose of personal experiences. Engaging spititual snippets. Dil Mange More.